In the world of entertainment, the word “play” has been used, forever. As athletic games are played on fields and in arenas, music is similarly played on a live stage or in a recording studio. 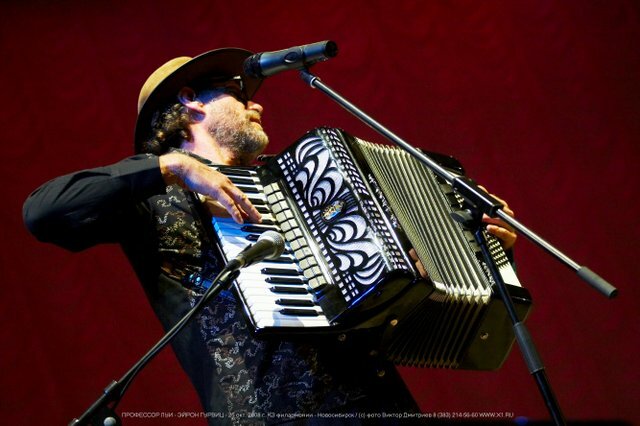 The indefatigable Accordionist, Aaron Hurwitz, known as ‘Professor Louie’, has participated in the game for a long time, as a multi-instrumentalist, a seasoned live performer and, behind the scenes, as a sought after session musician, recording engineer and producer. What a rare, “five tool player” is to baseball, Professor Louie is to the music business. By the 1980’s, Hurwitz was able to leave the odd jobs behind and work as a fully employed member of the music industry. “When I got with The Band in ’85, there was never a lack of great keyboard players, so there was never a lack of great musicianship, but what there was a lack of, especially in the mid-80s was technical people, who could engineer and produce. I started getting hired by a lot of musicians to help produce records and play on them and engineer”. It was during his time with The Band that the name and persona, ‘Professor Louie’ was invented. Rick Danko, vocalist and bassist for The Band was “actually the one who gave me the name Professor Louie, because that’s my middle name and a lot of The Band guys used their middle names…you know Levon Helm’s middle name is Levon and Garth Hudson’s middle name is Garth. What happens is all through history, keyboard players have been given monikers, like Count Basie, Duke Ellington, and Professor Longhair, Doctor Lonnie Smith” …While performing as a duo with Rick Danko on stage,”Rick would start calling me Professor Louie, and it was really a great honor. Most people, especially those on the business end, knew me as Professor Louie. So I kept it”. Professor Louie remembers that, “my experience working for The Band was great, and a great lesson in learning the music business and the music of that time…The Band was really the source of Americana music. They were actually one of the first groups to be classified as Americana”. In addition to his friendship with Rick Danko, one of the critical relationships in Professor Louie’s professional career was that of Garth Hudson, accordionist and keyboardist for The Band.”I got more into the accordion of course after hanging out with Garth Hudson. The one thing that always appealed to me about the accordion is that nobody was playing that much rock ‘n roll on it and blues; it’s always been more of a traditional, ethnic or classical instrument”. But Garth Hudson was, perhaps, the only musician at that time, to focus on the accordion as an instrument that could play rock ‘n roll, blues, and gospel infused country music. He was, after all, Bob Dylan‘s accordion player. The Band produced three final albums in the late 1980’s and early 1990’s. Professor Louie co-produced, engineered and performed with The Band on Jericho, High on the Hog, and Jubilation. Professor Louie and his backing band, The Crowmatix, were also featured musicians on Rick Danko’s album, Times Like These, before Rick’s death and they also performed on Garth Hudson’s solo album, The Sea to the North in 2001. Since that time, Professor Louie and The Crowmatix have tirelessly toured throughout the world. The group features Marie Spinosa of Brooklyn, N.Y, or “Miss Marie”, a powerful vocalist, songwriter, pianist and percussionist. Also, Grammy Award winning Gary Burke, who was the drummer for Bob Dylan, Graham Parker and many other groups. He performed on over a dozen albums with Joe Jackson, and was a drummer for The Radio City Music Hall Orchestra for four years. Frank Campbell, bassist for The Crowmatix, played bass for the Rick Danko and Levon Helm tours, and was based for many years in Austin, Texas. He moved to Woodstock, N.Y, which is now home base for Professor Louie, as well. Josh Colow, from Woodstock, N.Y. is an in demand rhythm and blues guitarist. He toured with his own groups, Jesse Winchester, as well as other renowned musicians. About Woodstock, Professor Louie says, “being in an area like the Woodstock area, where there’s so many musicians who live here, everybody has a little bit of a common cause, it’s sort of like living in a big college campus. I think by everybody being in a place, with a lot of people doing the same creative type of work helps, and also the Woodstock area has been great for recording studios. There are a lot of people coming in and out recording. And that’s what separates this area as opposed to some other music areas, is that sometimes people will travel to record here. You can meet people from other places, and Woodstock also has a good film festival, so there’s a lot of creative energy in general and always has been. For hundreds of years, that’s why people have come here”. The latest offering by Professor Louie and The Cromatix is “Music from Hurley Mountain“. 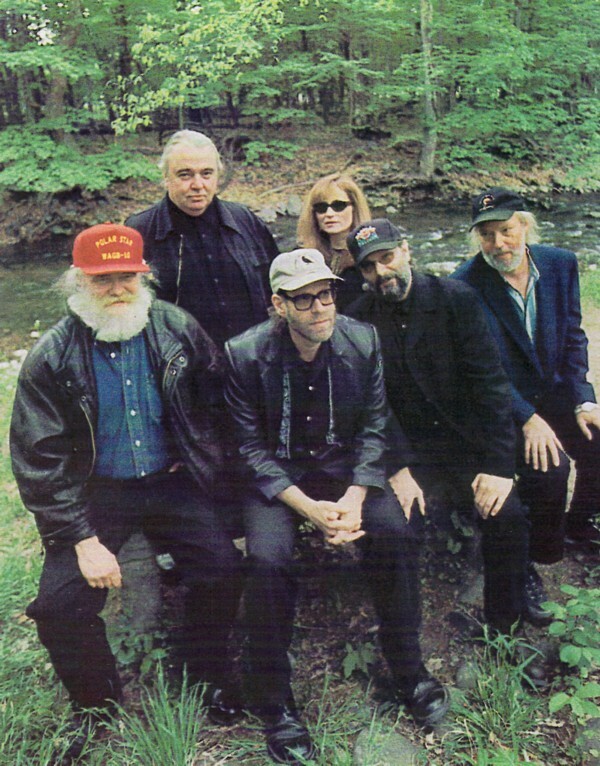 The album opens with “Golden Morning,” and closes with “Goodnight, Hurley,” In between, it tells the story, in four chapters, about Ulster County, located in the Catskill Mountains of New York State, from its initial settlement until its eventual home to a unique group of musicians who have made it the epicenter of their lives. The John and Anna Kaufman farm and barn, just across from Hurley Mountain, is one of four original farms in the area. It became the site of the recording studio that would become central to The Cromatix and to other musicians and sound people, local and legendary, that would make their way to Hurley Mountain to record. The studio has been in existence for thirty years and is now known as the Rock and Roll Barn. Professor Louie explains, “John (Kaufman) chugged on by many a day” in his classic John Deere tractor while Louie was recording. One day Louie finally put the microphone out the window. He commemorates that moment and the family in “John’s Tractor” with the use of the ambient sound of the Kaufman’s tractor from long ago. They further honor the site with the straight up rock ‘n’ roll celebration, “Rock ‘n’ Roll Barn“. “Crop Dustin’ Blues” evokes an old Animals vibe and addresses a long environmentally challenging practice still used to this day. Professor Louie and his ensemble, The Cromatix, move in a traditionalist direction with acoustic instrumentation used extensively in tunes such as the sweet and sentimental “Family Reunion”, “Four Farmers” and the swampy “You Got Me Dizzy“, composed by Mississippi bluesman, Jimmy Reed. Louie features the accordion throughout the album, most prominently on the opening and closing compositions. Professor Louie shares lead vocals with Miss Marie in most of the album’s songs, including “Light In Your Eyes”, a beautiful, soulful ballad performed in the tradition of the nineteen fifties and sixties. Other personnel featured on Music From Hurley Mountain consists of drummer Gary Burke, guitarist/vocalist John Platania, bassist/vocalist Frank Campbell, lead guitarist Josh Colow and violinist Larry Packer.